Webinars can be an important part of your lead generation strategy. Read on for how to get started with your own webinars. As a marketer, one of your main goals is to generate leads – lots and lots of leads, so that some of them ultimately turn into sales. And that’s where content marketing comes in: a cost-effective marketing tactic that is consistently generating amazing results for businesses of all shapes and sizes. One of the best forms of content for lead generation, especially when it comes to B2B, are webinars – and in this blog post, I’m going to show you why you need to add webinars to your content marketing strategy and how to get started. 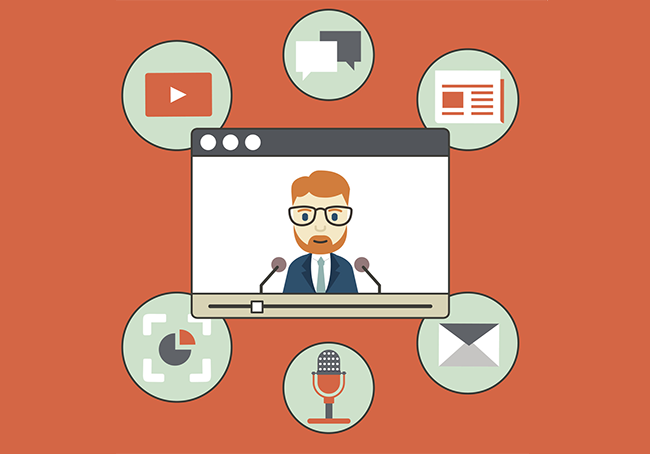 So, what exactly are the benefits of using webinars? One of the biggest benefits of webinars is that they are great lead generators. Or, better said, they are great at generating high-quality leads. So while you might not get 100 attendees on your first try, those you do get are very likely to be a part of your core target audience. However, not just any webinar will generate these results; the webinar needs to be highly relevant to your target audience and the marketer needs to find a way to capture these leads effectively by following up with the right content. Webinars offer a lot of value to the viewer, more so than many other popular forms of digital content. That’s because not only do they focus on specific problems, questions, or debates, but they’re also more interactive. The viewer sees the speaker, hears them, and in some cases, they also get to actively interact by asking questions, starting conversations in the chat window, and so on. This level of value and engagement naturally leads to improved conversion rates. By empowering prospects, presenters build brand equity, allowing people to visualize their own success using your product – and thereby advance along the sales funnel. ClickMeeting’s recent report on the state of webinars in 2018 found that 65% of webinars focus on content that educates the audience. While this statistic is telling, I’m a bit surprised that it isn’t higher. When you create and share content that provides a lot of value to your audience, you are effectively showcasing and demonstrating your deep knowledge of a subject. That is something that helps you build trust with your audience and not only that, it also helps show them that you are an expert in your industry and that you are the right person, the right business, to help solve their problems or fulfil their needs. So now we know the why’s of using webinars, how exactly can you get started? Educational webinars, for improving awareness and authority, building trust, and generating more leads. These are webinars where your pick a certain subject or a particular issue that your target audience is facing and show them how to solve it. Product webinars, for promoting your own products, explaining the benefits and showing people how to make the most out of them. These are perfect for existing customers if you want to build up their trust and loyalty. Panel webinars are webinars with a panel of different people and, of course a host. Panel members can be social influencers, thought leaders, or industry experts that you interview and hold discussions with about different relevant issues. These are great for build trust and credibility, and generating leads. Q&A webinars, perfect for those who have an engaged audience. Use it as an opportunity to further engage them by allowing listeners an hour or so to ask you any questions. Social media webinars – using live streaming you can further engage your social media audience, generate more leads, and increase your authority. What are your goals and what do you want to achieve with this webinar? Who are you targeting with your webinar? What problems or issues will you be solving with your webinar? Once you’ve picked your goals, and a date and topic, it’s time to start putting it together and promoting it. One of the main investments you’ll need to make at this stage is a good tool so that you can brand your webinar, add all kind of elements that enhance your webinar (like polls and surveys, presentations, chat rooms, and whiteboards, to name a few options), and perhaps most importantly, so you can make sure that your webinar runs smoothly (i.e. no bad audio or video, people speaking over each other, and so on). Webinar promotion should start as soon as possible – the sooner, the better, so you can get more people to register for your webinar and at least 2-3 weeks in advance. And like with any form of content, you should ideally use a multi-channel approach to promote your webinar, for example: your email list, your website/blog, your social media accounts. The first step though? You need a landing page where people can find out more about the webinar and register with their personal information. Some useful tools include Wishpond and Instapage – but, you’ll also be able to build a landing page with some webinar tools. So, how do you promote this landing page and the webinar? Add webinar opt-in forms or “ads” promoting your webinar throughout your blog and website to get people to sign up. Write a blog post about the webinar and the topic you’ll be covering to give readers a taste of what’s to come. Promote your webinar and its registration page on your social channels daily. Pin your webinar promotional update to the top of your social media feeds. Pay for social media ads to promote your webinar to a larger audience. Use your cover photo as an opportunity to promote your webinar. Change your links in your profile bios to link to the webinar (until the webinar is done). Email your list to promote your webinar. Add a link to the webinar registration page in your email signature. Another big benefit of using webinars for your business is that they are, in some cases, evergreen content. But whether or not they’re relevant 5 years from now, one thing is for sure: you can continue to use your webinars to drive results, and you can also repurpose them. However, in order to do this, you need to make sure your webinar is recorded and archived. Thankfully, most webinar tools do this but it’s worth checking it’s available on the one you’re using. Use them as incentives for generating more emails for your list. Send it to the webinar registrants that didn’t get to attend. Post is as gated content on your website or blog to generate more leads. Upload your presentation to Slideshare and your video to YouTube to reach wider audiences. Cut down your webinars into short videos that you can share on your social media. And, of course, don’t forget to measure your results and use the knowledge to optimize your future webinars. Webinars can be extremely powerful lead generation and sales tools for a business; they provide a lot of value to the viewer, which helps build trust and niche authority, improve engagement and lead generation, and most importantly, generate more sales and customers. Highly regarded on the world speaker circuit, Lilach has graced Forbes and Number 10 Downing Street. She’s a hugely connected and highly influential entrepreneur. Listed in Forbes as one of the top 20 women social media power influencers, she was crowned the Social Influencer of Europe by Oracle. She is listed as the number one Influencer in the UK by Career Experts and is a recipient of a Global Women Champions Award for her outstanding contribution and leadership in business. Connect with her on Twitter.